To find other materials at suns along the Mohawk related to Haiku North America 2015, click on the HNA 2015 Category in our right-hand margin. update (October 18, 2015): Check out the HNA weblog for many photos of the HNA 2015 Conference, which has been roundly applauded as a great success. 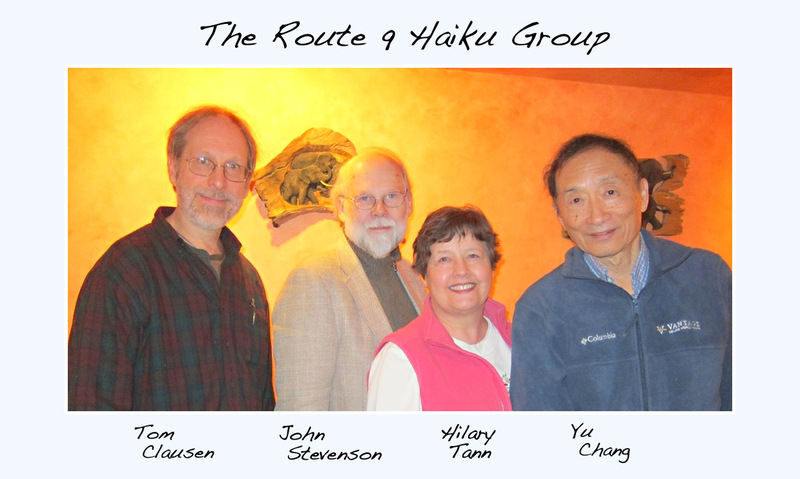 The Route 9 Haiku Group is the “home team” for Haiku North America 2015, which takes place at Union College in Schenectady, New York, October 14-18, 2015. 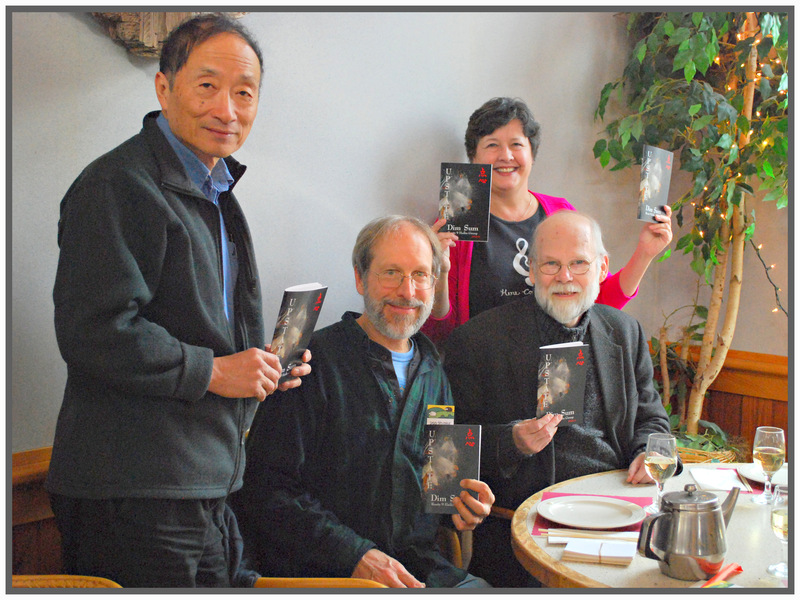 Haiku North America 2015 will attract many of the best-known English-language poets, educators and publishers, along with haiku lovers of all kinds. 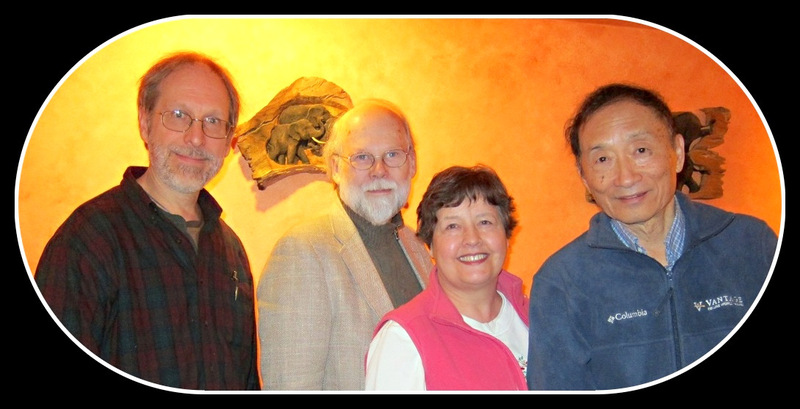 The four members of the group are: Yu Chang, Tom Clausen, John Stevenson, and Hilary Tann. Hilary is Professor of Music in Union College’s Department of Performance Arts. Yu taught computer and electrical engineering at Union College for 40 years, until his very recent retirement. Now that John has retired from a position in human resources with New York State, he has more time for his seemingly nonstop artistic adventures. Tom, who lives across the State in Ithaca, New York, is also recently retired, from his librarian duties at Cornell. 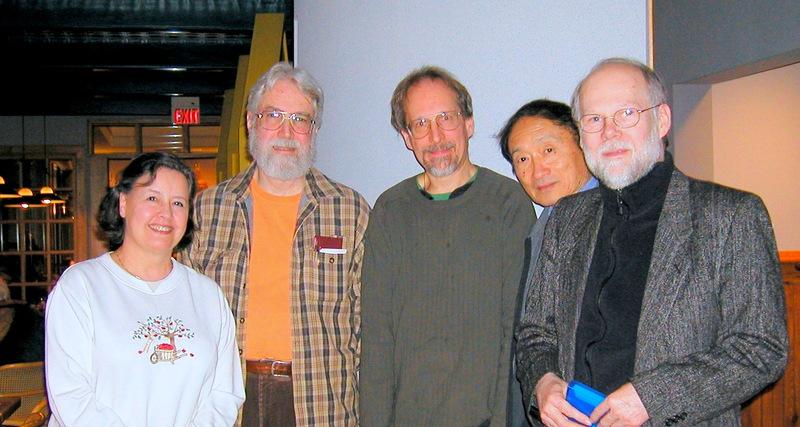 Since October 2000, the Group has set aside poems from those presented during the meal for publication. The first edition of their journal, Upstate Dim Sum: An Biannual Anthology of Haiku and Senryu, was published in the Spring of 2001. 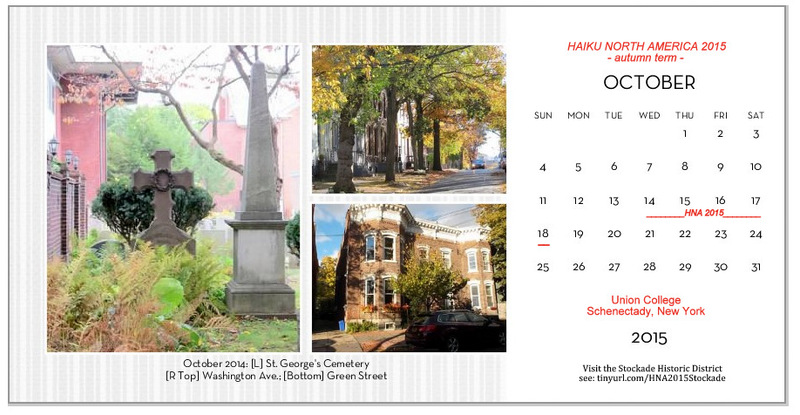 UDS features the haiku of the Four Members, plus a distinguished guest poet for each edition, and haiga by Ion Codrescu. 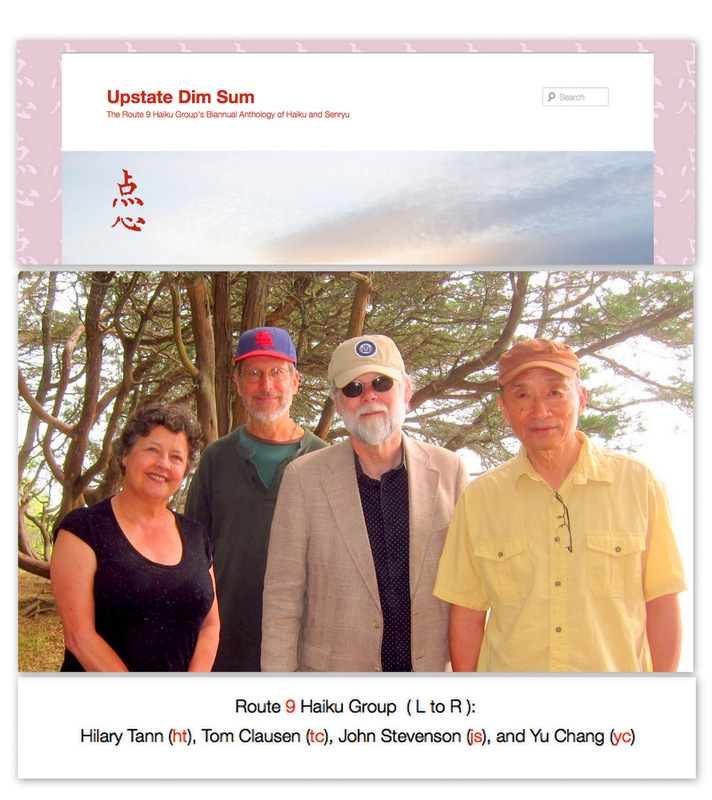 The members fell into complementary roles in producing Upstate Dim Sum, with Yu Chang selecting poems from those set aside at their meetings, Hilary overseeing publication, and John handling “outreach” chores such as marketing and subscriptions. Their Process. The monthly meetings of the Route 9 Haiku Group at the Tai Pan feature new haiku and senryu, shared and discussed over a leisurely meal of three, four, or five hours, with dim sum served at intervals throughout. Each member is expected to bring 16 new poems, written on three sets of index cards (four sets, if Tom is able to join them from Ithaca, 180 miles away). Tom sends in his poems, when he cannot be there. The index cards are dealt face-down, then turned over and read silently by all, including the author, one at a time. After a period of response and discussion, which was sometimes very brief and sometimes as long as ten or fifteen minutes, the next poem is dealt. At the end of a three to five hour meal, favorite poems are selected and added to a pool for the next issue of Upstate Dim Sum. Only about half of the poems in the pool are eventually used in the Journal, but many of them can be seen thereafter in other haiku publications. As John has written, “We hope that this process, featuring a series of check points, is producing a good selection of poems. It is certainly producing good friendships and one day each month that we eagerly anticipate.” Christopher Herold’s prediction that the model presented by the Route 9 Haiku Group might be the “wave of the future” could just come true, after the fruits of their labors, inspiration, and friendship are demonstrated at HNA 2015.